We're pleased to announce that we are starting to sell gingerbread supplies this year. We now sell leaf gelatin sheets! These make perfect transparent, edible gingerbread house windows. 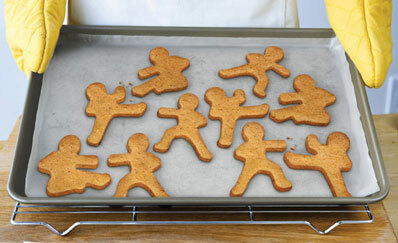 New: Ninjabread Man Cookie Cutters. You have to see these to believe! And see this page for other unique cookie cutters. We also sell gingerbread house kits and, of course, we're adding new gingerbread house patterns regularly. More products coming. Check back soon! We're still looking for a partner who sells gingerbread supplies: gingerbread house kits, and cake decorating supplies (fondant, gum paste,...) so that we can quickly expand our product offerings. Contact Us if you're interested in working together. In the meantime, we've compiled here a list of our favorite decorating supplies and molds that we consider must-haves and nice-to-haves for gingerbread house building. Candy Pebbles (These are the top of our list because they're SO great for chimneys, walkways, stone walls, and any other landscaping or gingerbread house accents that would be made out of stone. They're also rather difficult to find, so we list them first so you can be on the lookout and buy them before you get ready to build your gingerbread house. These are some of our favorites gingerbread-related supplies. Have fun building and decorating YOUR gingerbread house or gingerbread cookies! And make sure to come back and share your photos on our site! Return Home from gingerbread supplies page.